Bouteloua gracilis, Blue Gramma: Zones 3-10; fine-textured light green-gray foliage, turning purple after frost; full sun in dry, poor soils, but tolerates a wide range of soils except poorly-drained wet soil; 8-24″ tall x 18-24″ wide; drought tolerant and moderately salt tolerant. Buchloe or Bouteloua dactyloides, Buffalo Grass: Zones 3-9 and native to prairies in the Midwest; fine-textured gray-green; full sun in well-drained clay loam soil (does best in areas that receive only 10-25″ annual rainfall; 2-5″ tall and forms a dense sod, making it perfect for no-mow lawns; drought tolerant. Carex: Carex pensylvanica, Pennsylvania Sedge: Zones 4-8; very fine-textured, semi-evergreen; sun to part shade in moist well-drained or dry soil; 8-10″ tall; can be used as a light traffic lawn; drought tolerant. Carex plantaginea, Broad-leaved Sedge has tan flowers before the somewhat crinkled evergreen leaves emerge. Grows 8-10″ tall and does best in part or full shade in moist soil. Carex platyphylla, Broad-leaved Silver Sedge grows best in average to dry soil in part or full shade. There are so many different carex, that’s there’s one for any site! Eragrostis spectabilis, Purple Love Grass: Zones 5-9; purplish inflorescence in late summer; light green foliage turns bronzy-red in fall; 8-18″ tall; full to part sun in sandy, dry soil; drought tolerant. Hordeum jubatum, Foxtail Barley: Zones 5-9; wispy, purplish flowers in spring-summer; fine-textured foliage; 1-2′ tall & wide; full sun and tolerates a wide range of soil, even salt; may outcompete other species; shouldn’t be grazed by cattle. Schizachyrium scoparium, Little Bluestem: Zones 4-9, dense, upright tufts of fine-textured, blue-green foliage that turns bronze-orange after frost; 1.5-3′ tall; full sun in a wide range of soil conditions (not wet) and even grows under Black Walnut trees; drought tolerant; seeds are important food source for birds. Sporobolus heterolepis, Prairie Dropseed: Zones 3-9; fine, fountain-like mounds (plant in mass since it doesn’t spread much); unique fragrance like coriander; 2-3′ tall (when delicate seedheads are in bloom); full sun; tolerates a wide range of soils; birds love the seeds. Sporobolus airoides prefers wet, alkaline soil. Asarum canadense, Canadian Wild Ginger: Zones 3-7; deciduous kidney-shaped leaves 2-7″ across; 8″ tall; shade to part sun in well-drained soil; larval food source for pipevine swallowtail butterfly. Heuchera americana, Coral Bells: Zones 4-9; great foliage; 12-24″ tall; prefers part sun to part shade and rich, moist, well-drained soil; looks nice along borders or in beds; deer resistant; nectar source for butterflies and hummingbirds. Hydrophyllum canadense, Bluntleaf Waterleaf: Zones 4-7; large maple-like leaves; wispy white to purple flowers in spring to summer; ~15″ tall; shade to part shade in rich, moist soil; best for woodland gardens and along streams; deer resistant; nectar food source for native bees. Pachysandra procumbens, Allegheny Spurge: Zones 4-9; attractive, layered-looking foliage; bottlebrush-like whitish flowers in spring; 6-10″ tall; prefers shade in moist, well-drained organic soil; great for erosion control on banks. 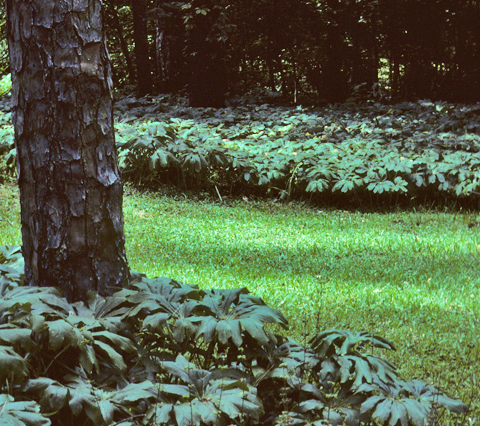 Podophyllum peltatum, Mayapple (shown at top): Zones 3-8; interesting, large umbrella-like leaves; 8-16″ tall; prefers part to full shade and moist, rich soil; grows well in woodlands and other shady gardens (can spread vigorously, but looks stunning). Polemonium reptans, Jacob’s Ladder: Zones 2-7; delicate looking ladder-like leaves emerge in early spring; light blue flowers in mid to late spring; 10-16″ tall; part sun to part shade in moist soil; one of few plants to grow under Black Walnut trees; deer resistant; nectar source for butterflies, honey bees and native bees. Sanguinaria canadensis, Bloodroot: Zones 3-9; unique, deeply-scalloped, leaves that unfolds as the flower each one is wrapped around blooms; short-lived white flowers with yellow centers in early spring; 5-12″ tall; part sun to shade in moist, well-drained soil; perfect around the base of trees, even Black Walnuts; deer resistant; attracts hummingbirds, butterflies & songbirds. Tiarella cordifolia, Foamflower: Zones 4-9; heart-shaped lobed leaves that turn reddish bronze in autumn and are evergreen in mild winters; wispy white flowers in spring; 3-10″ tall; part shade to full shade in organically rich, moist soil; deer resistant. Waldsteinia fragarioides, Barren Strawberry (not edible): Zones 4-7; evergreen foliage that turns brownish in cold winters; yellow flowers in spring; 4-6″ tall; prefers full sun to part shade (stays green better in part shade) dry to moist, well-drained soil; grows well in rock gardens, woodland gardens; deer resistant. Zizia aurea, Golden Alexanders: Zones 3-9; attractive foliage all summer long; bright yellow flowers in late spring; 12-24″ tall; sun to light shade and moist soil; can spread aggressively in ideal conditions; larval food source for butterflies. Opuntia humifusa/compressa, Eastern Prickly Pear Cactus: Zones 4-9; padlike, prickly leaves; large satiny yellow flowers throughout late spring/early summer followed by dark red fruit; ~8″ tall and spreading; full sun and dry, sandy soil; drought tolerant; nice planted at the base of a south-facing wall, in rock gardens, on sandy slopes or as a border; pollen & nectar source for native bees. Sedum ternatum, Whorled Stonecrop: Zones 4-8; small, evergreen leaves; little, star-like white flowers in late spring; 2-6″ tall; prefers full sun to shade and rich, moist, well-drained soil; grows well in rock gardens and containers. Arctostaphylos uva-ursi, Red Bearberry: Zones 2-6; glossy & evergreen foliage that turns bronze to reddish in fall; bright red fruit in late summer into fall; grows to ~9″ tall; prefers sun to part sun and sandy soil. Cornus canadensis, Bunchberry: Zones 2-6; dogwood shaped leaves that turn red & purple in fall, as shown here; showy white bracts (not technically flowers) in late spring into summer, then small red fruit; ~6″ tall; prefers part shade and moist, well-drained soil. Epigaea repens, Trailing Arbutus: Zones 3-9; aromatic, evergreen foliage; early spring flowers are white with a reddish tinge and very fragrant; grows to 6″ tall; rather particular growing conditions, preferring sandy soil in the shade of pines and oaks; larval host for Elf and Hoary Elfin butterflies. Gaultheria procumbens, Teaberry or Wintergreen: Zones 3-5; evergreen turning reddish in fall & winter; pinkish/white flowers lead to red fruit with wintergreen fragrance; 6″ tall; part sun to shade in moist, organic soil with good drainage; rather finicky as it does not tolerate heat & humidity or drought. Juniperus horizontalis, Creeping Juniper: Zones 4-9; easy to grown; long, trailing branches of dense, green/bluish green foliage turns purplish in winter and remains evergreen; tiny bluish cones into winter; ~12″ x 4-8′ wide; sun and sandy/rocky soil is best, but is quite adaptable to many conditions, except shade and poor drainage; salt tolerant. Rhus aromatica ‘Gro Low’, Fragrant Sumac cultivar: Zones 3-9; looks somewhat similar to its cousin Poison Ivy, but is NOT poisonous; beautiful orange and red fall color; red fruit may persist into winter; 1-2′ tall x 8′ wide; full sun to part shade in dry to medium soils; drought tolerant; larval food source for Banded Hairstreak & Red-banded Hairstreak butterflies. Vaccinium angustifolium, Lowbush Blueberry: Zones 2-5; glossy, delicate foliage; flowers produce small, sweet blueberries (enjoyed by both humans and birds) in summer; better pollination with multiple shrubs; excellent reddish fall color; 1-2′ tall x over 2′ wide; full sun to light shade; tolerates a wide range of soils, but does best in well-drained, acidic soil; beneficial to native bees. Vaccinium vitis-idaea, Lingonberry/Mountain Cranberry: Zones 2-6; small evergreen leaves turn reddish in winter; small white or pinkish flowers in spring are followed by dark red edible fruit in late summer; to 12″ tall; sunny conditions and moist, well-drained soil high in organic matter.